Lumines II is one of the reasons I haven’t been blogging much here over the past couple of months. 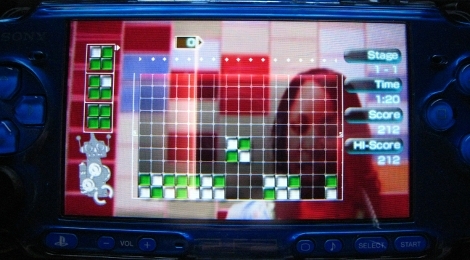 The object of Lumines II is to match like colours of falling blocks so they form a square of four. The vertical Time Line passes horizontally across the grid and makes all matched blocks disappear. Music is always playing and when you land blocks or match blocks, it makes sounds. Sometimes the sounds are bleeps and bloops, sometimes they’re precussion sounds, depending on the song playing. I started with the basic play mode, Challenge Mode. The goal I set myself was to beat the top score (100 000 points) on each of the Challenge Modes: Class B (beginner), Class A (intermediate), and Class S (advanced). I started with mastering Class B, and moved up to the next Class after I reached 100 000 points. As you complete levels in Challenge Mode, those levels/songs get unlocked. You have the option to create a play list of unlocked songs, so you can play through levels you’d like in whatever order you want. You can also loop your play list endlessly. After I felt I had a good grasp of Challenge Mode, I moved on to Vs. Mode against the CPU. Rather than having the entire screen to yourself, you share it with the CPU, and you are in a head-to-head fight to clear your side of the board of coloured blocks. A centre line, defining the edge of your territory, moves left or right depending on how well you’re doing. Meanwhile, the Time Line continues to pass across the playing field as it does in Challenge Mode. If you do badly, it compresses your play area, which makes it harder to clear the board, which in turn makes your play area even smaller. Meanwhile, you have blocks falling from the top. It’s really fast-paced, and the computer is, of course, very good. I’ve only been able to get to level 9, at which point I kept losing and got a bit frustrated. Battling the CPU allows you to unlock more characters (basically the images of your opponents). If you look at the screen shots above and below, you’ll see a robot in the lower left hand corner. That’s the computer boss I defeated, and I adopted this as my avatar. Mission Mode sets you specific tasks, such as clearing the board after a certain number of passes of the Time Line or clearing the field of blocks within a time limit. Mission Mode is pretty fun. I’ve been able to finish all but two of the hardest missions. 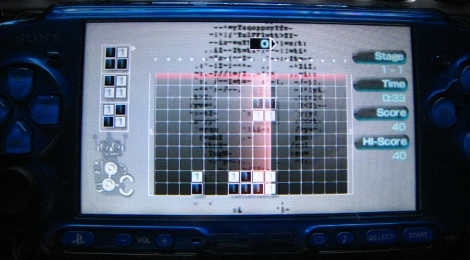 The music in Lumines II is a mix of original and licensed music. I think the music selection is great overall. I’m not super clued in to pop music because I’m not often exposed to it. I don’t watch television or listen to commercial radio, and many of the bands I like probably wouldn’t get commercial radio air time anyway. The licensed music on Luminess II was fresh and new to me, and there weren’t too many songs that I disliked, so it wasn’t a big deal to play levels over and over. The screen shots pictured in this post are two of my favourite levels to play because the tunes as well as the sound effects the blocks make are cool. The first one is “Bottle Rocket” by The Go! Team, and the second one is “Black Tambourine” by Beck. If your battery happens to die whilst you’re playing, which happened to me several times, after you plug it in/charge it and then turn it back on, your game will be paused, right were you left it. This was a very handy feature. Lumines II is a really addictive puzzle game. I have spent so many late nights in bed playing Lumines because I simply could not put it down. Lumines II was a great purchase and it has a lot of replay value. I’d recommend it to anyone who likes music games and/or puzzle games. ETA – 12 July 2009: A couple of people have let me know that the game resume feature if your battery dies is a standard feature for all games, not just Lumines II. This is the only game I’ve played and had a low battery interrupt my play, so I didn’t realise this was requirement for all PSP games. I guess with the PSP battery life being so short, it make sense. Good stuff. I was completely bowled away by N+ on the PSP, and was looking out for more great puzzle games. Thanks for pointing me to this one, looks great!